This is a super simple activity that you can do anywhere you have a glass of water and some paper and a pen. 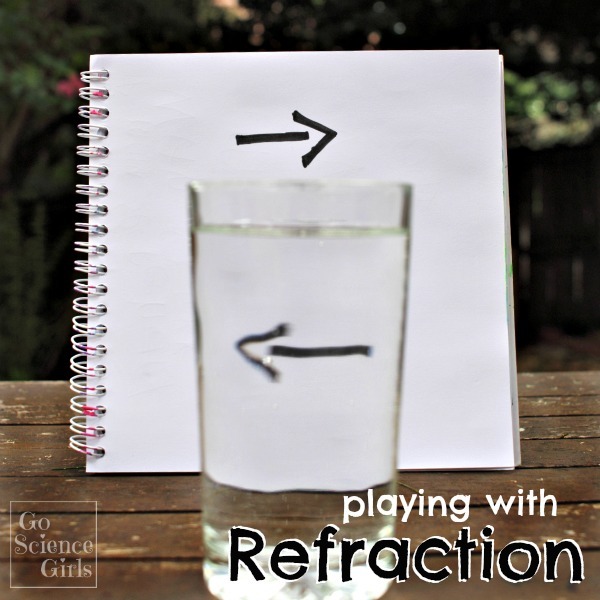 Go Science Girls has a full rundown of different options and ideas for playing with refraction, starting with as simple a thing as drawing two arrows and then looking at one or both through a glass of water. The arrows seem to change direction depending on how you look at them. Likewise, other things you draw will change position or how they look based on how you look through a glass of water at them and the position of the glass relative to the paper and your eye. What we are seeing here is a physics concept called refraction, or the bending of light. When light passes through transparent objects (in this case, the front of the glass, the water, and the back of the glass), it refracts or bends. When the glass is full of water, it acts as a cylindrical convex lens, and produces an inverted image. The inverted image may appear larger, smaller or the same size, depending on where you position the paper, the glass, and your viewpoint. Another variable is the size (diameter) of the glass. This is such a clever idea and it’s sure to keep even little kids entertained while waiting for food at a restaurant or whenever else you need a little activity to fill time. Older kids can draw their own pictures and observe how they change when looking through the glass. So fun.